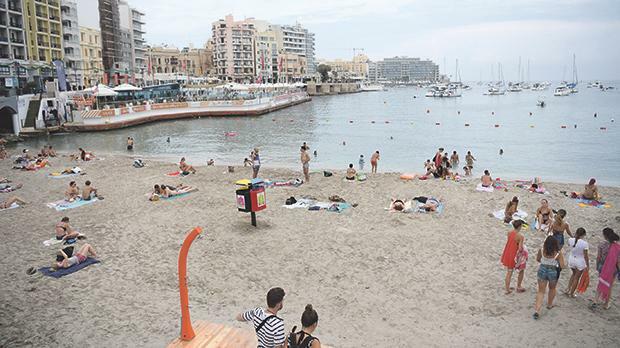 Having spent a couple of weeks in the heatwave that is afflicting northern Europe with temperatures exceeding by some degrees the worst July hot days with 31˚C and 32˚C in Malta, I returned to spend some weeks in Sliema. To my absolute disgust I realise that walking along the Sliema/St Julian’s seafront (and probably the same applies to Marsascala, St Paul’s Bay, Marsalforn, Buġibba and Qawra) has become a very unpleasant experience. One cannot walk more than 20 metres without passing by a complete stranger walking, running or just sitting in the main artery of my home town, without a T shirt or a top on. These young and not so young men, some with pot bellies, many with ugly tattoos and all sweaty, think and say that everything is allowed in Malta and that our cities and the Maltese who inhabit them, in the south, north and centre of Malta, are there to be insulted. Indecent dress is not allowed by law in towns and cities in Malta and Gozo, nor should buses, restaurants, coffee shops, shopping malls and other public places be exempted. Yet, we see no signs telling our bad-mannered tourists, bad-mannered non-Maltese residents, of which there are far too many, that tops and shirts should be worn at all times by both men and women apart from the beach. Our policemen are nowhere to be seen patrolling the various streets, both waterfronts and core village and city streets including Valletta, telling these uglifying presences to cover themselves. I have been a vox clamans in deserto, telling every single one I pass by, or drive by, to put on a shirt and politely ask them to respect our towns and cities because people live here. Locals do not like sweaty chests or bikini tops anywhere but on the beach. I risk getting attacked or physically injured by these uneducated guests in our country, even though I ask them politely to cover themselves since this is a city where we live and they, as visitors, should respect our decency laws. There is a fine of up to €700 for indecent dress but it is rarely invoked. The police are busy taking care of the ever-growing number of more serious crimes like murder, like stopping fights in Paceville and traffic accidents. The police also invoke a law that seems to conflict with the decent dress in cities and towns, namely the law that states that up to 100 metres from the sea may be considered a beach. However, in the hierarchy of laws, a built-up area within city limits is a city not a beach and, yes, 100 metres from the Golden Bay or Mellieħa Bay seashore, where no people reside apart from a tourist hotel or two, would be considered a beach within the 100-metre interpretation so people can walk up to their cars in bathing trunks and bikinis. But as soon as they reach built-up areas like St Paul’s Bay or Mellieħa town, whether in a car or on foot, on a bus or in a coffee shop, they must cover their chests and wear a blouse or dress over their bikini. Recently, a coffee shop owner who forbade, and rightly so, a Scandinavian tourist from being served because he was bare chested, was attacked and replied to with severe arrogance by these visitors who are not welcome unless they behave properly. I suggest four small improvements. A big set of notices at the airport and Sicily ferry terminus telling all visitors that tops and shirts should be worn at all times in all built-up areas of Malta and Gozo. Bathing wear for men and women is only allowed on beaches. Fines of €700 will be applied to non-observers. MTA, MIA, MHRA and police please note. All mayors of towns and cities with beaches and rocky seashores close or within their areas to set up signs every 500 metres along the sea promenades and shopping areas with the same message. Police officers and wardens to be allowed to issue warnings and, if ignored or responded to rudely, on the spot fines to all offenders. All Maltese residents, coffee shop, restaurant and shop owners of whatever nationality should help put a stop to this creeping uglification of our promenades and streets. Most offenders are foreign and, apparently, think we, the residents, are just holiday island waiters and smiling locals there to welcome their dollars and euros, kronors and zlotys and be grateful. We are not. We are a proud and decent people who want fewer bad-mannered visitors and many more respectful and good-mannered ones. Of all the people I have stopped or approached to explain politely what I think of their indecent exposure, most have apologised and put on a shirt (maybe taking it off as soon as they got out of sight of the Maltese busybody), some were questioning my argument saying it was hot, Malta is a cesspit anyway so who cares, some gave me the finger or even a threatening clenched fist gesture. No one has manhandled me, yet. Many a time I call the local police station to report those who use vulgar language or complete disregard to me and, sometimes, the police do send out a constable to intervene but most times they are too busy with serious offences. Everything is not allowed in our Malta. John Vassallo is a former ambassador of Malta to the European Union.